To an artist, early blooming flowers are a dream. For people with allergies, they are a nightmare. "The past week my eyes were very irritated and I was rubbing and rubbing them. I'm new to the area so I just figured it was the pollen in the air and the fact the trees are blooming, " said Judith Smith, who recently moved to San Jose from Vermont where she experienced no allergy symptoms. Dr. Theodore Chu with South Bay Allergies and Asthma recently checked his pollen collector in the South Bay and said most people can blame their recent sneezing and watery eyes on the grasses and blooming trees. Chu added that oak, birch, and juniper trees are also spewing out a lot of pollen right now. "I think its earlier than usual because of the dry warm weather," he said. 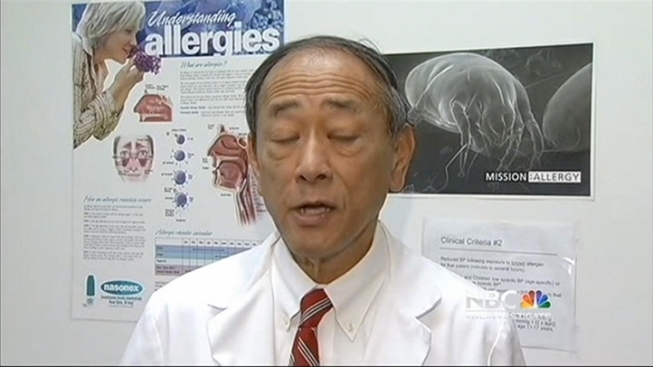 "I think we will see a lot of allergies this year" Chu added. He says the valley collects a lot of pollen, so if you're miserable head north or to the beach. If you can't do that, try to stay indoors, avoid doing yard work and wash your hair when you come inside so you minimize your exposure to pollens. If you are still suffering, Chu recommends over-the-counter medications such as Claritin and Allegra. If that doesn't work he suggests you see an allergist for relief.